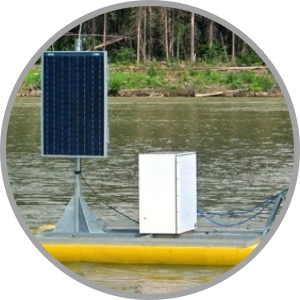 Manitoba Hydro - FTS Inc.
Manitoba Hydro has been using radio telemetry, dataloggers and turbidity sensors for a number of years as part of an early warning suspended sediment load monitoring system on the Burntwood River in Manitoba, Canada. Turbidity arrays were deployed from 6 rafts both upstream and downstream of the Burntwood River dam construction site. With virtual real-time data telemetry and analysis, turbidity data is converted to suspended sediment concentrations (SSC) using established sediment rating curves (NTU SSC ratings) developed over several years of monitoring. StreamTrac software provides the automated data collection, processing, normalization, graphing and alarm notification. Upstream, background SSC is automatically computed and used to normalize downstream monitoring sites. By correcting for background in real time, increased SSC, as a result of construction activities can be immediately detected. Using this early warning detection network, construction activities are optimized to maintain SSC within safe limits for the local ecology.